The percent of total visible light that is transmitted through the window film/glass system. The lower the number, the less visible light transmitted. The percent of total visible light that is reflected by the window film/glass system. The lower the number, the less visible light reflected. The percent of ultraviolet (UV) that is blocked by the window film/ glass system. The higher the number, the less UV transmitted. The SPF rating is a measure of the protection from UVB ultraviolet radiation caused by exposure to the sun. It is calculated by comparing the amount of time needed to produce a sunburn on protected skin to the amount of time needed to cause a sunburn on unprotected skin. 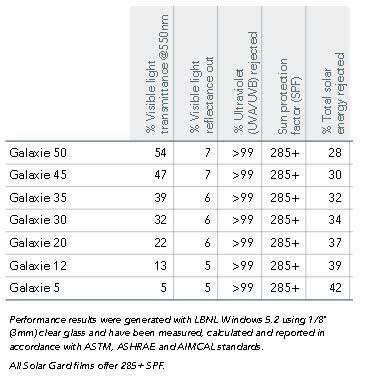 Solar Gard Galaxie window films block up to 99% of both UVA and UVB. The percent of total solar energy (heat) rejected by the window film/glass system. The higher the number, the more total solar energy (heat) rejected.